A Day Dreamer's World: Book Festival Freak-Out! This weekend was busy - the understatement of the century. Living on Costa Coffee, I was at the Bath Kids Literature Festival on Saturday and in Cheltenham for the Literature Festival there on Sunday! To sum it up in one word: surreal. I was nervous throughout most of last week about the impending festivals: it's not every weekend you get to meet a blogger and then you're favourite authors. When I got up on Saturday morning to go to Bath, it still didn't hit me that today was the day. I only really started shaking when I walked into where the event, an e-Writing Workshop with Siobhan Curham, and realised it was happening. I'd never been to Bath before, only driven through when on my way to safari parks during the holidays, and I can't wait to go again. It's such a beautiful city, and all the buildings have such a Victorian-style to them. At one point, there was even a horse and cart riding through town! L-R Me, Lucy and Siobhan Curham! The event itself was held in the Holburne Museum(something I have been spelling wrong all week - only to realise when I saw the sign) and it was such a brilliant venue! I had a quick wonder around upstairs at the art on show, and there was a portrait of the Duchess of Cambridge there for one weekend which I got to see. When I decided I may as well go downstairs, I noticed the room the workshop was being held in was open, saw Siobhan and freaked-out a little. When the women asked me to write my name on a badge, I said: "I can't" because I was that nervous! Then Lucy(From Queen of Contemporary) walked in and we exchanged books - I got an ARC of Dance of Shadows by Yelena Black and the talk got underway after hugs from Siobhan! It was lovely to finally meet them both, and Siobhan's talk made me realise how so many find starting a blog intimidating in a way. Many people are too afraid to start a blog while others believe nobody would actually read their blog. This was so interesting to hear - especially knowing how, when you get involved, it's a huge amount of fun! I mean, I wouldn't even be at the event if I hadn't set up a blog! Despite being the 'experts' according to Siobhan, me and Lucy struggled to come up with any ideas for a blog name for eachother so, I decided on the 'Queen of Guinea-Pigs'. My excuse is that we were out of our natural environment! Thank you to Siobhan for a brilliant work-shop and it was great to meet you both! Day Two involved another drive in the car, this time I was considerably calmer so, I started Resist by Sarah Crossan! When my Dad parked the car, we headed into the main town centre in Cheltenham to find a bite to eat, and I ended up wanting to live there. They have a brilliant high-street with everything in one place as well as a community built on that with a town-hall! 'The American Dream' consisted of David Levithan, Maureen Johnson and Sarah J. Maas with me spending most of the time telling myself, "I am in the same room as some of the world's best authors." It was definitely a strange thought! Their discussion was funny, witty and I learnt a lot from it. I have a lot of respect for Maureen for coming along with Laryngitis and still being able to make a joke about "how American accents really sound like." My Dad sitting next to me, half-way through the talk turned to me and said, "What's YA?" - I couldn't help but laugh, or wonder what he thought they were talking about for the past half-an-hour! The discussions varied from one's about how they came to be published with Sarah writing a journal on a site called Live Journal, thinking nobody was reading it, only to have someone come up to her at a party and say something about it! This is when she found out her whole class was betting on who would be mentioned in the next entry, and that they were all reading about her life! One of my favourites was the stigma surrounding YA and the experiences the authors have had with it, along with banned-books(David Levithan's books 'Two Boys Kissing and 'Boy Meets Boy' on the receiving end of a lot of censorship). The fact that even Sarah had a, "Even Stephen King wrote YA to pay the bills" comment shocked me! Why does YA get this? I really liked finding out why each author finds writing for teenagers so interesting, especially since David thinks it's a time we have to find ourselves. When it came round to how franchises like 'The Hunger Games' were so popular, David said that it was down to "e-Readers" so people can read what they want on the subway(I want to live in the US!) - it also 'helps the Fifty Shades fans...!" The absolute highlight was meeting and talking to Sarah! 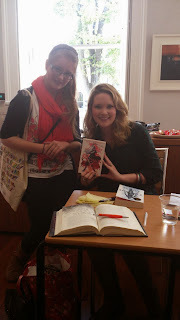 As my favourite author, I was completely overwhelmed to meet her and had to talk about Fleetfoot(Celaena's dog in Throne of Glass). I told her about how I felt when reading Crown of Midnight and my emotions, with her calling it 'The Migraine Book.' I can't help but agree with her on that one! I also met David Levithan who signed a copy of 'Every Day' I brought along! I did end up videoing throughout the weekend, and despite most of the footage being awful, I will definitely try to edit something together for you! That was my weekend! What are your most memorable book-festival experiences? Are you planning on attending any soon? What about the event being held by Malorie Blackman next July, in London? That's so exciting, it looks like you had a great time! When I lived in England I attended the Cheltenham Literature Festival to watch Cathy Cassidy speak and get her to sign one of my books! It was so much fun! OMG you met Sarah J. Maas?! :o I would have, like, DIED. It's interesting that David Leviathon brought up censorship (insert gasp here), and although I haven't yet read any of his works, I really do have a ton of respect for him. 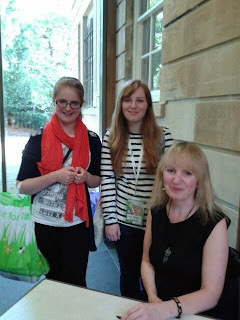 It's weird, because just last week I went to a book festival, and I was shaking too when I met the authors! I guess us readers look up to authors so much, and we view them so highly, that when we meet them, we feel like we're meeting a freakin celebrity. Gah, I am SO jealous! It sounds like you had an absolutely incredible time, and I can't believe you got to meet all those amazing authors! OMG I AM SO INCREDIBLY JEALOUS! It seems like everyone is meeting David Levithian and Sarah J Maas. I would so love to meet Sarah, TOG is one of my favourite series and COM had my emotions everywhere. I wish all these book festivals would come to Sydney. It seems like you had a lovely day and I really enjoyed hearing about it. I hope we get to see a possible vlog soon. Lovely pic of you girls.Thanks for sharing Sophie! THIS. SOUNDS. AMAZING. AHHHH! I want to go so badly!! YOU GOT TO ME SARAH J.MAAS!!!!!! *HUGGLES* That's soooooo lucky!! It's sounds like a lot of fun! Hopefully, I can come to Hays literature festival and then we can meet! !